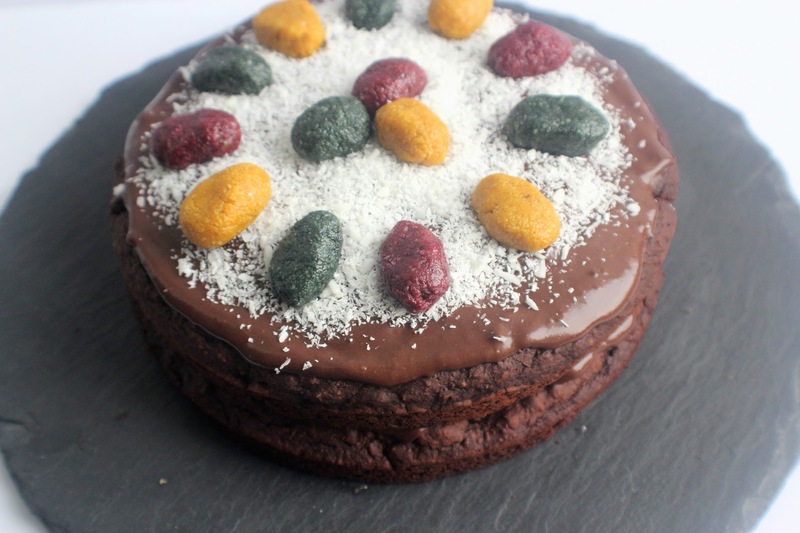 I think out of all the Easter-themed recipes I have created and posted on my blog recently, this is my favourite Easter #IndulgingInnocently creation. 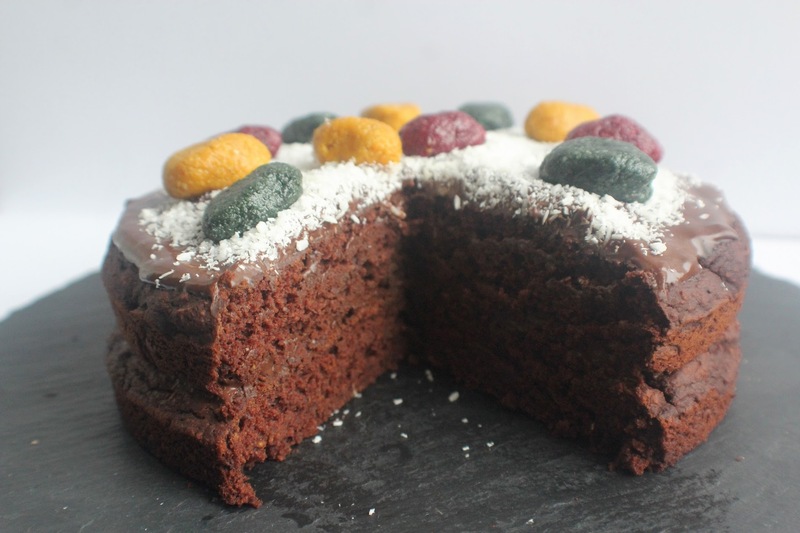 To coincide with International Sweet Potato Week (from 1st – 13th April) in collaboration with American Sweet Potatoes (you may have seen my other recipes over here) I’ve created a wonderfully delicious chocolate cake – yep, using sweet potato! 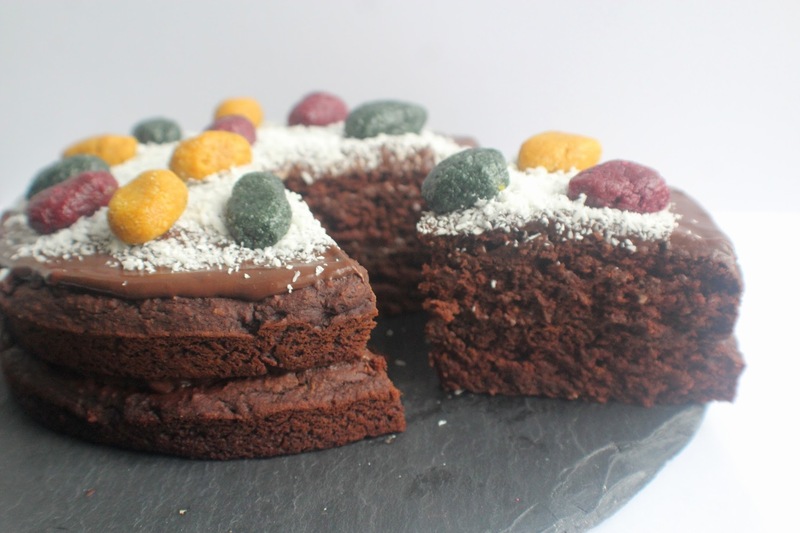 – layered with a rich chocolate ganache, finished off with cute superfood mini eggs. 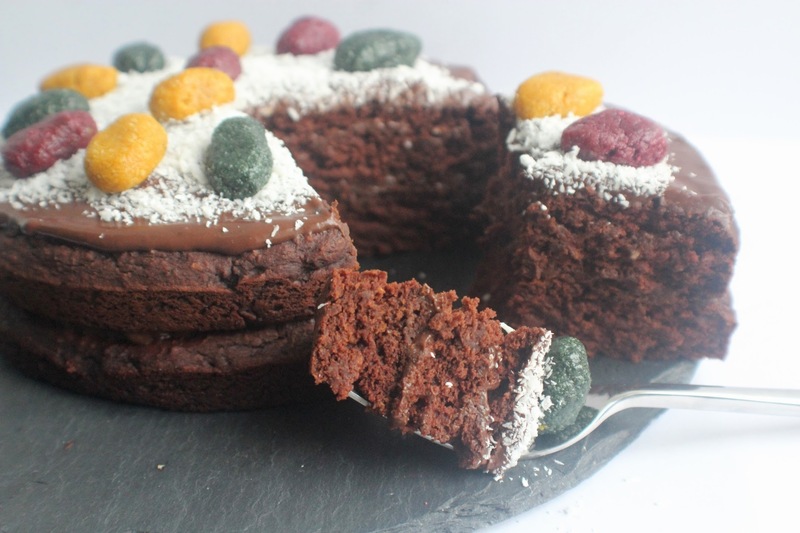 Vegan, gluten-free, dairy-free and with no refined sugar, a slice of this tastes much more indulgent than it actually is – making it a fantastic healthier but tasty treat this Easter – go on, you deserve it! Preheat the oven to 180 degrees C and grease and line 2 x 18cm round cake tins. First make the cake: Pop the cooked and cooled sweet potato, maple syrup, melted coconut oil, water, apple cider vinegar and vanilla in a food processor or blender and whizz up until smooth (I use my Ninja Kitchen Auto IQ). 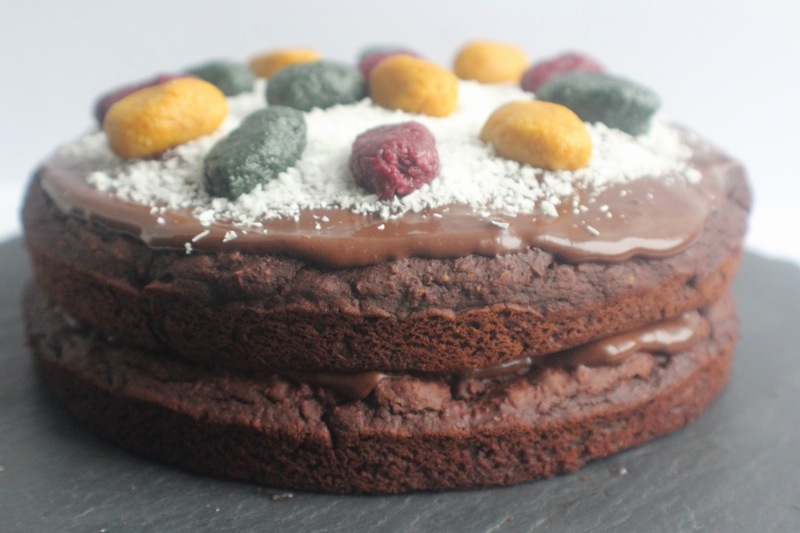 Now add the oat flour, ground almonds/almond flour, cacao powder, coconut sugar, flaxseeds, baking powder, bicarbonate of soda and cinnamon and blend again until you have quite a thick chocolate batter mixture. Divide the mixture between the two tins and spread out evenly. Bake for about 20 minutes until risen and firm, then leave to cool completely. Meanwhile, make the ganache: Gently melt the chocolate then remove from the heat and cool for 5 minutes. Now whisk in ¾ of the coconut milk and vanilla until smooth, then chill in the fridge for at least 30 minutes. Prepare the eggs: Get 3 small bowls and divide the ground almonds out. To each one add the different powders, then stir in the maple syrup so each mixture is slightly sticky and comes together. Roll into mini eggs then place in the fridge until needed. When the cakes have cooled, remove from the tins. If the ganache has firmed up too much, add a little more of the leftover coconut milk to thin out slightly (you still want it quite thick but spreadable), then spread over the top of each cake. Place one on top of the other. Sprinkle over the coconut on the top one, then decorate with the eggs. Now slice and enjoy! Keep any remaining cake slices in an airtight container in the fridge for up to 2 days.